Everyone recognizes Mickey Mouse, but how many can say where he comes from? For all his comfortable familiarity, Disney's iconic disc-eared mascot has a murky mythology. Besides his wide-eyed sorcery-slinging role in Fantasia, he's best known for piloting a steamboat, getting a goat to huff out "Turkey in the Straw," and smacking around a cat, some baby pigs, and a goose. Before that, he flew a self-built plane (badly) in an attempt to woo Minnie Mouse (violently) before crash-landing. His signature saucer-ears appear on greeting cards, signs, hotel placards, backpacks, club hats, cookie cutters, and head bands. He's beloved the world round, a wink and a smile in red shorts, white buttons, and yellow booties who's somehow transcended calculated origin stories and canonical histories. 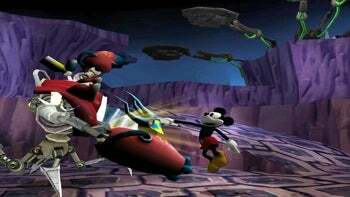 Enter Epic Mickey for the Nintendo Wii, Disney's intrepid handover of its mainstream mascot to Warren Spector, a designer best known for his edgy, dystopian games like the conspiracy-obsessed cyber-RPG Deus Ex and its similarly skittish but less cohesive sequel. But Deus Ex was hardly Spector's apotheosis. His better output includes Ultima VI: The False Prophet (one of the first games to grapple with racism), Wings of Glory (a creaky, wood-wonderful, zeppelin-flush World War I flight-sim to shame Red Baron), Ultima Underworld: The Stygian Abyss (the first-person RPG that beat id Software to fluid, fully-3D motion), and System Shock, a dread-spiked mash of William Gibson and Arthur C. Clarke that design compatriot Ken Levine's BioShock channeled to the masses--salt-and-peppered with Randian objectivism and philosophical determinism--over a decade later. Spector's last credited game was Thief: Deadly Shadows, the last installment in the medieval stealth series released in 2004. He's been silent running since, popping up in interviews or on design panels, but MIA from the "published" scene for half a decade. His Junction Point Studios, formed in 2005, was snapped up by Disney in 2007 without a game to its name. Earlier this summer, leaks revealed Spector was working on a project for the Wii starring Mickey Mouse. Purchased by Disney? A Mickey Mouse game? Sounded a bit sellout-ish for a guy with Spector's creds. 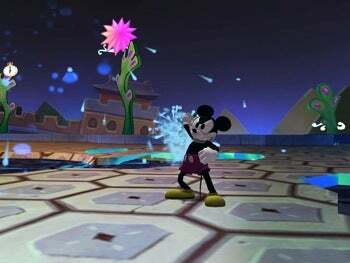 After all, Disney Interactive Studios describes Epic Mickey as "an adventure-platforming game with light role-playing elements." Not exactly brainpan-blowing. How many riffs on Kingdom Hearts--already dark, ethically composite, and thoroughly Disney-fied--do we need? 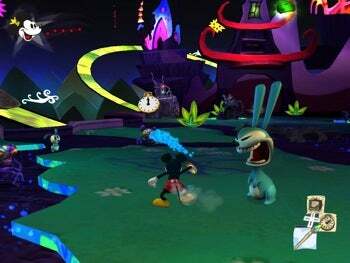 Consider Epic Mickey's premise, in which "a sorcerer named Yen Sid creates a beautiful, whimsically-twisted world where Disney`s forgotten and retired creations thrive." Think back to "The Sorcerer's Apprentice" slice of 1940's Fantasia. Remember the bulge-eyed, blue-robed sorcerer who conjures vaporous demons and butterflies from a skull? Disney's animators nicknamed him "Yen Sid" (think about the name's letter order for a moment and its import should come to you). In Spector's version, Walt Disney's Oswald the Lucky Rabbit--Disney's first cartoon star created in 1927--is trapped in Yen Sid's "cartoon wasteland" where he tends other neglected Disney toons. Why would Yen Sid torment these characters by relegating them to pen-and-paper isolation? Is Spector's Yen Sid (think about that name again) a not-so-subtle jab at tactless commercialism? Who knows, but it's all grist for Oswald, whose envy of Mickey's popularity conflates with circumstances in which Mickey accidentally devastates Oswald's world. The game subequently requires players assume the role of Mickey and grapple with the consequences of that unintentional, disastrous gaffe.